We knew that this was our last day at Hole-in-the-Wall, and we wanted to see just a bit more of the Preserve. One of the wide-spread features here is the large number of mines, and the old dirt roads/tracks that service them – – so we set out to see a few, namely the Columbia (off of Macedonia Road) and the Evening Star (off of Cima Road). Our day was yet another potpourri of sights, rocky roads, gorgeous weather, and yes even a little adventure. The day was long, relaxing, scenic and even educational, and it begs for some elaboration. But words can pale, and rather than any attempt at narration, I’ll simply present today as an annotated slide show. Here’s where we’ve spent the last eleven days. Barstow to the west, Las Vegas to the north, Needles southeast. Our base-camp is Hole-in-the-Wall, lower-right from center. On the slope above camp, a gang of barrel cacti supervise operations. Howie is in the foreground camp site. I-40 is about 15 miles distant. Our early-morning walk produces the usual smattering of cottontail rabbits. Barrel cacti are solemn, smooth, un-threatening – – but if you really intrude on their space, their two-inch-long quills are a hell of deterrent. These are woody, stiff spikes with points sharper than hypodermic needles. Hawks are on patrol everywhere, and the furry rodent population scurries below them across the brushy plain of their dinner table. Old mine shafts are usually blocked, grated, or otherwise shut off to prevent injury or death to people and animals. This one was casually boarded up, easy to enter, and way too dangerous to do so. It’s difficult to imagine how people made their living in this rugged terrain. Ralph perches on a gradual slope which leads down the the railroad tracks. A long freight train is crossing the valley below. The “new” trash from late-era mining always looks much more shabby than the early efforts’ leavings. It’s all still trash, but the 1800’s stuff looks more like it belongs with the terrain. Whenever a sand-wash crosses a railroad, there’s an underpass to permit natural drainage. Problem is, the underpass fills up with gravel and sand. Clearance can be an issue. Gotta dig the ruts a little deeper. It needed about four inches deeper in each rut, for ten feet or so. Ah, that’s got it (about one or two inches of clearance). A miss is as good as a mile, they say. After many more miles of rocky road, the towering old structures at the Evening Star mine make it all worthwhile. It’s an imposing affair, sound on the bottom but unsafe to explore any further up. Another closed and covered mine shaft in the area, very large and deep. Back in camp for the evening – – the distant lights of Las Vegas out-do the feeble glitter of the few campers remaining at Hole-in-the-Wall. We started out the day just as relaxed and kicked back as yesterday, but somehow the afternoon developed a life of its own. This morning, Karin took her usual walk. She has not yet gotten around to investigating burrowing animals here. And why should she? We bought an intriguing little book, Desert Holes, and have been studying up. At first, we thought it just a simple guide to what critter digs what hole (and it is), but it also has a plethora of information about things we didn’t know existed. – – – the list goes on. Amazing stuff, take a look at the book here on Amazon. I laid around and read, browsed (Internet is much improved during daytime), and whiled away the morning. Afternoon just begged for more exploring, and off we went. Did I say “get stuck” in a previous post? Really I didn’t mean it. Really. We turned off of Wild Horse Canyon road to the west and made our way toward Blue Jay mine. The road went from marginal to ugly and then pretty much impassable. Ralph is set up as a multi-purpose vehicle, and doesn’t compete with off-road-only configurations (some super-mudder tire prints of which preceded us). At 31 inch tires and 9 inches of ground clearance, Ralph’s qualifications are modest, and the road was extreme. Rainy seasons had made enormous gullies and ditches, not wide enough to drive in, but not narrow enough to straddle. The result was severe off-camber runs, punctuated by horrendous piles of washed-up jagged transmission-eating boulders. As we worked our way towards the inevitable no-go, a minor clutch of rocks tossed one up toward the rear driveline connect linkage. One flying stone nudged the link just a wee teeny bit toward the driveshaft, and it got caught in the spin and instantly mangled to a pretzel. In the cab, all we heard was bangitty-wappity-bangity-wappity, nearly the exact same sound as when a U-joint bearing fractures and collapses (ask me how I know this). Karin and I looked at each other with lots of white around our eyeballs. It was with real relief that I found the culprit. A few minutes with some wrenches and pliers and I extracted the junk parts, shifted the connect by hand, and we were off again. But soon after, the trail stopped (for us) at a V-shaped “road” full of hatchet-edged boulders the size of lawn chairs. We walked up the road only a few hundred yards more to discover the mine, which was in pretty good shape. Couldn’t say the same for the workers’ lodging, which was totally derelict and abandoned, old iron stove and bedsprings rusting in the desert air. Truly, it was a bleak sight, nestled amongst the old burned trees on a gray, flat day. Very hard to imagine living and working out here. 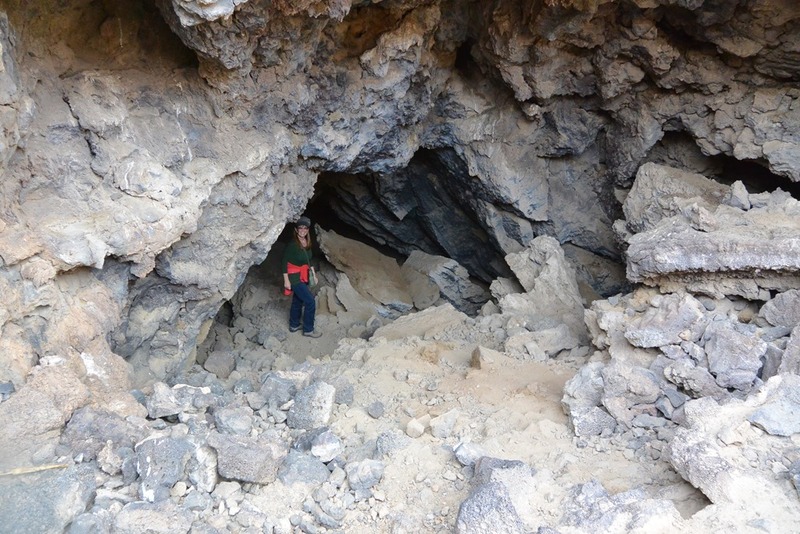 We have better sense than to enter any old mine, regardless of how sound it looks, so we just snapped some pix and went back to Ralph. He was waiting patiently, but he was pretty nervous that we might want to take him up that awful road. Pretty relieved when we turned back home. Us too. Walking anywhere in this area must be done with caution, not only because of treacherous terrain, but because of a local piece of pure vicious called Cat’s-Claw. This shrub-tree looks innocuous at first glance, but reveals its true colors when you get within a foot or two. ANY brush or intrusion is met with tenacious, needle-sharp hooked thorns that catch in clothing, skin, boots, even leather. Once hooked, a professional surgeon must be summoned to extract the claws. This maniacal desert assassin is also called the Wait-a-bit bush. Obvious. On the way back, we checked out the water supply for the mine. No water was in evidence, but near a natural drainage there was a large iron tank and a broken-up concrete cistern, typical technology of the time and area. So, all considered, a pretty decent afternoon. Got stuck, got broke, got fixed, got home. Saw some interesting stuff along the way. I’m sitting in Howie at the dinette, looking out the windows and typing. We’re in camp at the Hole-in-the-Wall campground in Mojave Preserve, California. Outside, the morning desert wind is blustery but not cold. For the second day in a row, Karin and I have set ourselves absolutely no goals whatsoever, and it looks like we’ll continue to be successful in achieving those goals. Yesterday evening we burned off some of our precious firewood hoard and celebrated our kick-back day. My cough continues to gradually subside, and this morning I awoke at 6AM, unheard of for me, and even reasonably rested. Sun not yet risen, the dawn light bathed Banshee Canyon in soft pastels, a gentle precursor to the stark arc-lighting of the desert day. The luxury of doing almost nothing is something both of us rarely experienced in our “former lives”. Working five, or six, or seven days a week (sometimes it seemed like eight) left little time for relaxation or reflection. More than that, the working attitude was something that dominated our lives, sometimes in very hidden and unconscious ways. In this new lifestyle, we find that we have to studiously concentrate on letting go – – on having it be okay not to accomplish something. We try to spend some time not making commitments, not making deliveries, and not being accountable. Sounds horribly irresponsible, doesn’t it? We are basically trying to simply be aware of the universe and appreciate it, but without being immediately responsible for it. We are ever so gradually learning how to let the Earth spin without our help – – at least for brief intervals such as yesterday and today. But there sits Ralph right outside our door, ready and eager to do some more exploring. Clearly, it’s just not possible (or right) to relax forever. Maybe we’ll go get stuck somewhere later today…. Today, we had only one “serious” mission: dump/fill. For those of you unfamiliar with this little RV delight, let me euphemize it by describing it as trading in old water for new. You see, RV’s have at least three water tanks: Fresh, Gray, and Black. Fresh is what it says. Gray is somewhat benign “used” water like dishwashing rinses and down-the-shower-drain flows. Soapy stuff but not particularly obnoxious. Black now – – this is the evil stuff. Toilet flushings. Black water could gag a maggot. And incidentally, it’s not black, it’s an insidious, threatening brown – – – but with texture. You get the feeling you could conduct biological warfare with this stuff. Might be true. WMD and all that. Are you gagging yet? Long story short, we simply found a “dump station” (our camp has one), hooked up a 3-inch sewer hose to the station septic port, and opened large gate valves to get rid of our “old” waters. Then we re-filled the fresh water tank and voila! we became happy campers again. What with setting up Howie to be moved, off-loading 70 gallons of varied sewage and on-loading 70 gallons of fresh water, then re-situating Howie back in camp – – this minor process took up well over an hour of our day. A camp neighbor came by and we BS’ed for at least another hour or two. And then there’s stuff like sitting, thinking, being quiet, getting a drink of water – – – you know, all that busy stuff you have to do when you camp. But all this is just banal camp drivel. I needed to show you that life on the road is not ALL fun and games (but yes mostly it is). The real entertainment of the day, however, came from a hike on the Loop Ring Trail and a climb-crawl down some nasty stone chutes of Banshee Canyon. Banshee Canyon is right near camp, and is named for the unearthly howling that ensues when desert winds play their music through exotic, intricate rock formations. The weathering in this place looks like a cross between the Goblins in western Utah and Bryce canyon, with a definitely spooky feeling in attendance. Striking. The canyon trail negotiates some steep, nearly vertical rock chutes which would be un-navigable except by experienced rock climbers, except for the installation of multiple grab-rings in the most difficult passages. These are the namesake Rings in the trail title. We spent a couple of hours patiently making our way down the chutes and around the Loop (it’s only a mile or so). 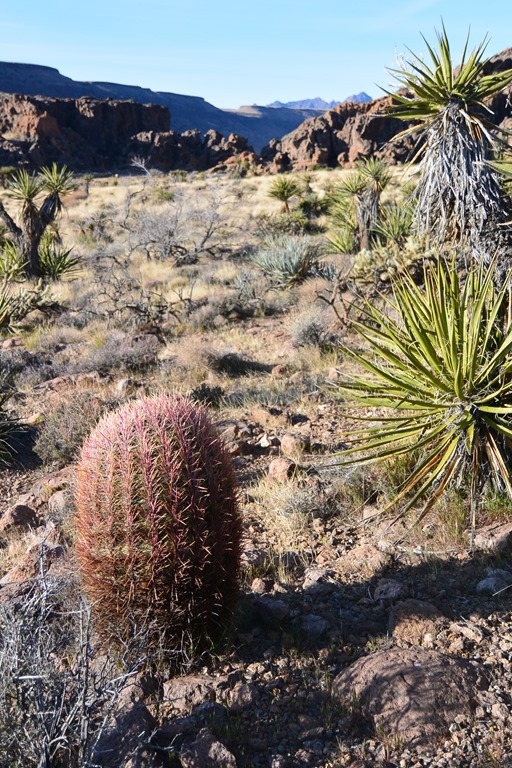 On the far side of the Loop, we found a dreaded devil cactus, with yet another cactus-wren nest safely ensconced in the cholla’s hideous embrace. This Trail is definitely another must-see in the Preserve. The evening presented us with one of the nicest selections of desert sunset artistry we’ve seen (and we’ve seen a lot of them for sure). The sky was full of mid-level strato-cirrus, and the moisture level up there must have been right on the dew-point, because the clouds kept forming, moving, dissipating, and re-forming with the upper-level winds. The visual result was simply outstanding. Bottom-lit clouds stretched from horizon to horizon, north-south-east-west in golden/red profusion. Everywhere we looked, there was a different, dynamically-changing display. The phenomenon lasted for many, many minutes in the slanting winter sunset, and we soaked up every moment of it in amazed, head-swiveling reverence. Even Howie was mesmerized, as you can see by his glassy stare. After the light show was over, a fine barbecued rib-eye steak dinner put the cap on yet another fine day. 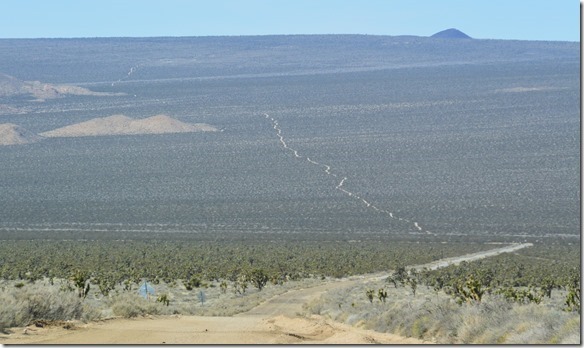 In this case, the cut was about 20 miles of the ancient Mojave Road. This little track runs about 140 miles from Barstow to the Colorado River (between Needles and Las Vegas). Like so much of the area, the Road is steeped in geology and history. It’s hard to convey the total sense of delight that both of us experienced in traveling this ancient Indian trail, now an easy 2WD/4WD back country track. Firstly, it’s REMOTE. We were far away from the paved road, which is itself far away from the Interstate, which is far away from any town of any size. We were <way> out there and very glad for the spare gas, water, tools, and our satellite phone. Second, it’s GORGEOUS. The desert is pure, simple, serene. We were surrounded by plants and animals and incredible scenery, from long winding sand washes to massive lava flows to towering cinder cones and massive rocky ridgelines. Although signs of man’s touch were visible, we still had a sense of the primeval. 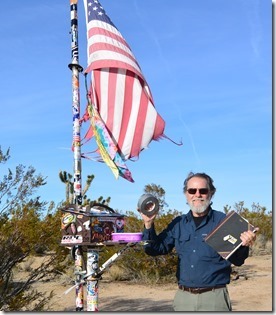 As we chunked along the winding trail, Karin spotted a weird sight: a faded American flag fluttering gamely in the desert breeze. 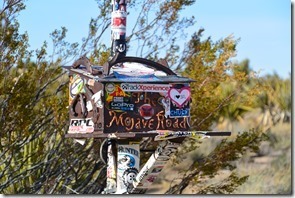 At first, we thought we’d stumbled on a remote camper, but no, it was the venerated Mojave Road Mailbox. This delightful little treat has a sprinkling of traveler’s remnants inside: some beef jerky, a roll of duct tape, bottles of drinking water. Also sheltered is a large, dense logbook full of travelers’ entries, to which of course we added our own. 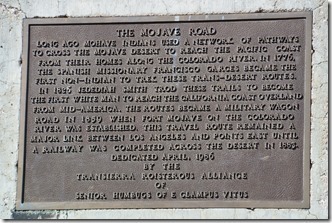 According to guidebook comments, the Friends of the Mojave use the book entries to gauge road use by visitors. Past the Mailbox, we crossed the Powerline road and its enormous parallel strings of monster towers, carrying unimaginable quantities of precious juice to the masses. 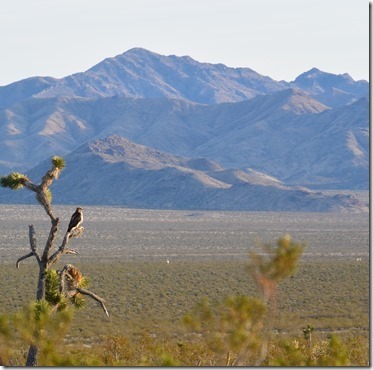 Later, crossing a broad slope above a broader valley, we rolled past a hawk scouting from a Joshua tree for an evening meal. 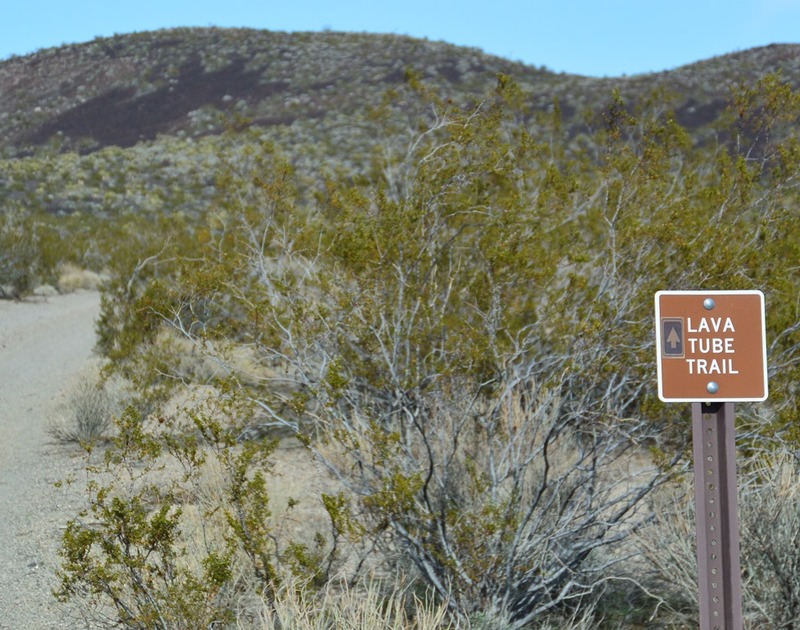 Per our maps, guidebooks, dead reckoning, intuition, and perhaps mostly pure luck, we popped out of the Mojave Road fantasy-land and back onto Cima Road right where we needed to turn into Cedar Canyon and head on back to camp. Dusk was settling in as we pulled into HITW camp. Howie wagged his tail in greeting and we settled satisfyingly in after a splendid day. FINALLY starting to feel really better today, with the cough diminishing and my energy continuing to rise. Still not up to a lot of hiking, though, so a short morning walk was all I tackled. The morning sun lit up the slope west of camp. This area is favored by the barrel cacti, and their purplish spines set off many hillsides. This plump fellow guides the way to Banshee Canyon in the distance. 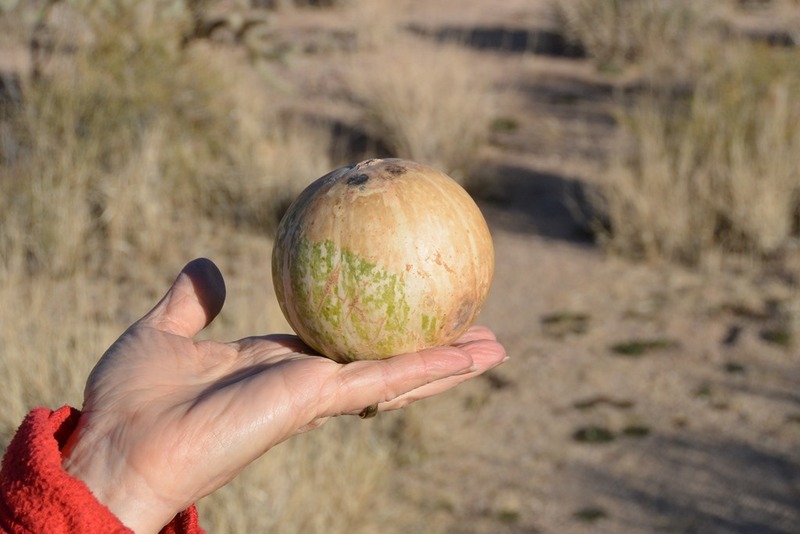 Another oddity we’ve never encountered before: the coyote gourd. Looks like a small un-ripe watermelon, but it’s light and some of them rattle with internal seeds. After breakfast, we decided to gas up Ralph. At 1/4 tank, we didn’t have the comfort zone needed for long lonely desert roads. Nearest gas is at Needles or Baker, each about 70 miles away. 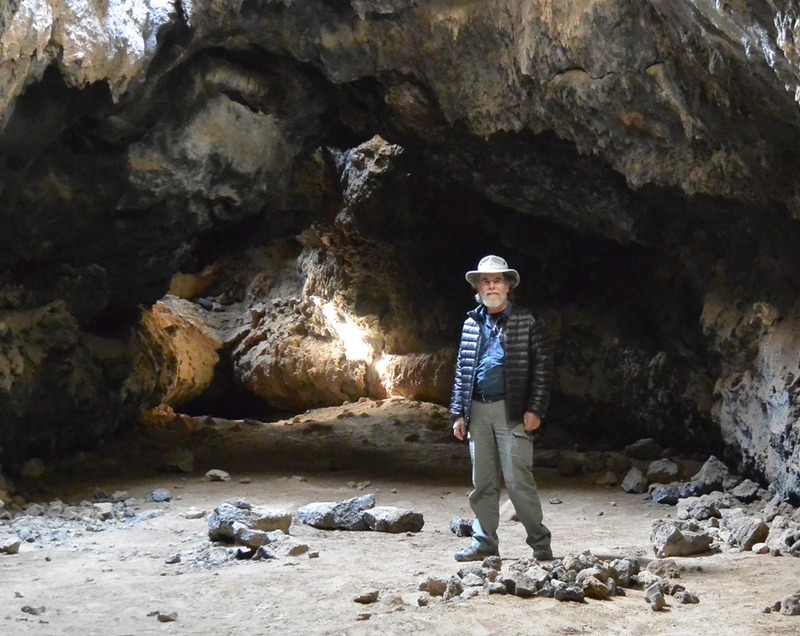 But Baker was close to something we wanted to see, the Lava Tube area, so that was our pick. Baker is a nondescript whistle-stop about halfway between Barstow and Las Vegas, on I-15. Coming down off the high country of the Preserve, it looked like nothing more than a thin scattering of shacks along the Interstate. Gee whattayaknow – – that’s what it was. Driving back into the Preserve, we were amazed at the total lack of signage of any kind. Major (dirt) roads simply darted left and right off the main Kelbaker road (Kelbaker – – Kelso to Baker – – get it?). Some roads went somewhere, some didn’t. Fortunately, we have a great NatGeo map and some terrific guidebooks, and they helped us find the Lava Tube Trail, which (finally) was flagged by this gallant 6” square notification. 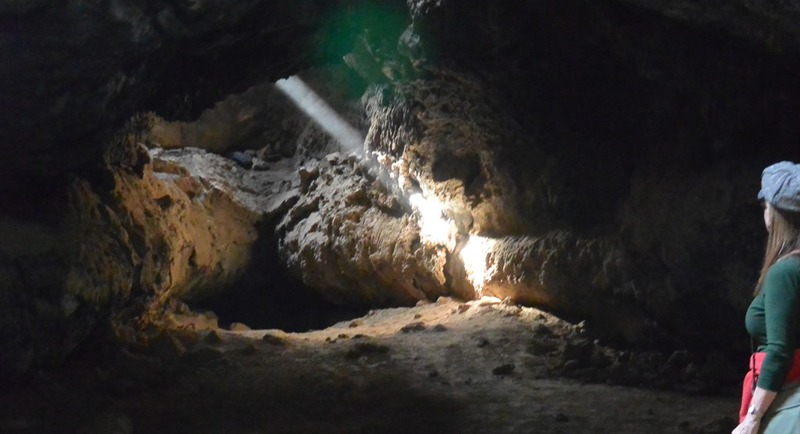 The Lava Tube was smallish, as such structures go, but nevertheless intriguing, eerie, and charming. Several holes in the roof let sunlight streak in at various places. When we walked the old dusty floor, the sunbeams took life and became Luke Skywalker laser swords scything down into the tunnel. After Baker and the Lava Tube, it was getting late. Ralph was waiting patiently amidst the deep green creosote, the lava flows and cinder cones. – – to be continued. Enter your email address to have new posts automatically sent to you by email.